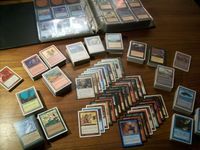 Subject: What to do with about 2000 Magic Cards from 1994-2002? I dug up my collection (it isn't really a collection unfortunately) of old Magic cards which I haven't been doing anything with for the last 15 years or so apart from occasionally admiring them. I'm not sure what I should do with them. I don't really want to get rid of them, I don't really want to start playing again, so I ask you what you would do with them in my situation. I don't think there's anything of value in there. I thought about buying the Challenge Decks and trying to beat them with my old cards. Would that even be possible? Or would you sell them? Give/throw them away? Build something with it? Some kind of geeky art? Hell, I don't know. I haven't started it yet, but I have a similar problem. I am thinking about taking my old and worthless cards, arranging them on a table and doing a clear epoxy coat over the top to make a cool looking gaming table. If I had those and didn't want to play with them, I'd figure out if any card is worth more than $10, and sell those as singles. The rest can be sold as bulk for next to nothing, given away, or make something out of them. But using them to play against the challenge decks is a good idea as well. They should work fine for that. That's a pretty good idea! Be sure to post some photos once you finished the table. Well, I imagine figuring out if there's anything of value would be a huge undertaking. I'd have no idea where to start. Would I have to search for every single card in a database? I guess it wouldn't hurt to buy at least one challenge deck to try if playing against them is any fun. I can still throw them away or build the table after that. Do you have any Dual Lands? those are worth big money, even in German I would wager. Probably not the commons but a lot of those cards are old enough to not have a clear marker of rarity. 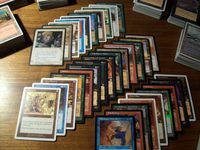 A good place to start is Magiccardmarket.de too see what the second hand market gives for them in Europe. When I had this problem I created an account at deckbox and added every card I owned. It took a few days, but in the end I was confident that my collection was all but worthless. The card it identified as being my most valuable was one that I would never have noticed, in fact I still can't understand what it does. Sure, I could follow the rules, but why? I read about Dredge and believe all that stuff's true but don't really get it yet. Dredge decks are wierd, they throw everything about Magic out the window. You need to see it in action to understand. Here is a goldfishing of it so you can see what it does. One reason I main board Rest in Peace. Ok, turns out my most valuable card is Reflecting Pool from Tempest. Then there are about 50 cards above 1$ and the rest is basically worthless. So I guess I'll buy the Challenge Decks and keep that table idea in mind. 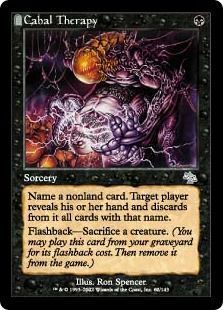 Try to make an EDH deck. I play with alot of older cards. You should see the look on players faces when they see a card they never saw before. Oh, and all of a sudden I understand why Dryad Militant says that as well. You'll get the most value for your cards if you own a retail store, and can afford to carry them and wait for the kind of people who buy games at retail. This will get you (for example) prices around TCGPlayer high for what sells. More realistically, as a player you'll get the most value for your magic cards if you create a trade binder of your valuable stuff, go to magic events, and slowly sell or trade them to others for their valuable stuff, which you also sell locally to players. This will get you prices around TCGPlayer mid for what sells. This does not appeal to most people trying to get rid of their collection. You'll get the least value if you sell it on eBay without showing the valuable cards, because everyone will assume it's all crap. Plus you have to cover the eBay fees (including the 10% for shipping). This will get you a penny a card minus fees. This does not appeal to people who don't know which cards are valuable, and don't want to take the time to look. - local players willing to buy whole collections. Of those, I think you'll get the most money from an honest local player willing to buy everything you have - let's say TCGPlayer low - 30% for valuable stuff, plus half a penny a card for the rest. You might look around on BGG for other players in your area. All prices approximate guesses based on experience.